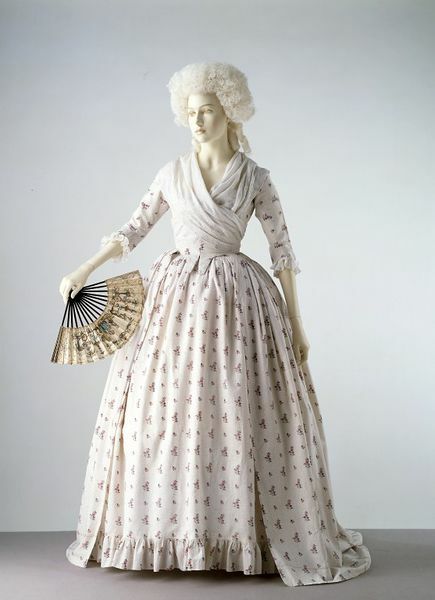 In the 1770s and 1780s printed cotton fabrics began to replace silk in popularity for women’s gowns. The material of this gown has a dotted ground and is printed in a repeating pattern of floral sprays. The gown has a fitted back and open front below the waist, revealing a petticoat of the same fabric. 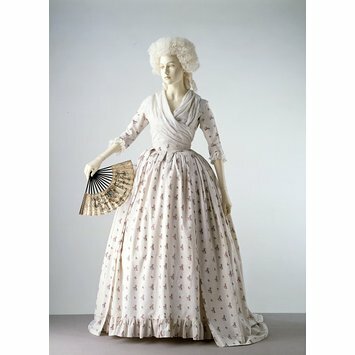 The lack of decoration and use of cotton instead of silk indicates that this gown was probably worn during summer afternoons for card games and tea parties, rather than for evening dress. A woman's gown and petticoat of white cotton block printed with a design of stylised floral sprays in pink, blue and green alternating with smaller floral sprays, probably inspired by Indian embroidery. The ground is filled with a diaper pattern in dotted red broken lines. There are double blue lines in the selvedge. The gown is open at the front with shaped, elbow-length sleeves. The bodice and skirt are cut separately and seamed at the waist. The bodice meets at centre front. The back is made of 4 shaped pieces, tapering to a point below the waist at centre back. The bodice front and 4 back pieces are lined with bleached linen and stitched together. There is a casing stitched on each side of the centre back seam, with holes below the neckline for two bones (missing). A casing is stiched in the lining of the bodice fronts below the neckline, for narrow linen tape drawstrings. The skirt is made of 3 widths of cotton, finely flat-pleated into the waist seam. There are pocket openings in each side seam of the skirt. The petticoat is of 3 widths of cotton, with a box pleat at the centre front and centre back, and flat pleats at the sides. The waist is bound front and back with linen tape, forming ties to fasten at each side There are hemmed pocket openings on each side. A ruffle of cotton is sewn to petticoat hem. The gown once had a deep hem, which has later been let down.